Our river cruise boat made it through the five locks in the Three Gorges Dam in about five hours beginning around 10:00 pm, at which time, of course, we were asleep. The next morning we toured the dam along with everyone else on the boat. Big dam. Then we headed down stream for the last of the Three Gorges, the “most treacherous,” due to its fast current, completing the river journey in the “small town” of Yichang, population 1.5 million, and the place where most of the Yamaha pianos in the world are made. A transportation service met us and deposited us at the huge new, very crowded high speed rail station in time for the usual on-the-second departure, this time 2:30 pm. A good Samaritan helped getting the bags on the overhead rack. We were off to Hefei. (or “He Fei,” you see it both ways.) What did I know about this city before hand or why we were going there? Nothing. You could ask how two elderly travelers could stumble through China with no idea where or why they were going to the next destination. In our weary defense all I can say is it is a pretty long trip, it is hard to keep up with all the moving parts, and we like surprises. A bunch of surprises were ahead of us. We were met at 7:17 pm at another behemoth station by our new guide, “Ellen,” who was actually standing on the platform, a no-no in these stations, only passengers allowed. If you want to get an idea of how big the new, high speed rail stations are, think Dulles Airport terminal. She explained she “had connections,” and charged toward the exit with Embry’s bag in tow with Embry at her heals. I staggered not far behind. Hefei was only an overnight stop to allow us to go to the main attraction the next day, Huangshan, or the Yellow Mountains, said to be the most beautiful mountain range in China, which we learned from Ellen. She is in her early thirties, married with a three-year-old son, and does not have a seventy-year-old grandmother. In fact her grandmother died a few years ago in her early eighties. Could spell trouble, I thought, since we no longer had a compelling, anti-forced-march tactic. It turned out that of all the terrific guides we have had, Ellen was the most knowledgeable and the most honest; and since we traveled with her in the car for several hours, we learned a great deal about her personal life and about modern China, most of which I will have to save for a subsequent blog post. That evening we collapsed after a good Chinese meal at our luxury Westin Hotel and were sort of rested and ready to go at 9:30 am the next day (negotiated down from an 8:00 am departure). We briefly told each other what we were doing here, and it turns out he is a Harvard Business School professor (late 30s) on a Sabbatical and also going around the world, studying various economies, having spent the last several months in China. But, sadly, there was no time to go into depth because Ellen and the driver were waiting, rested and raring to go. 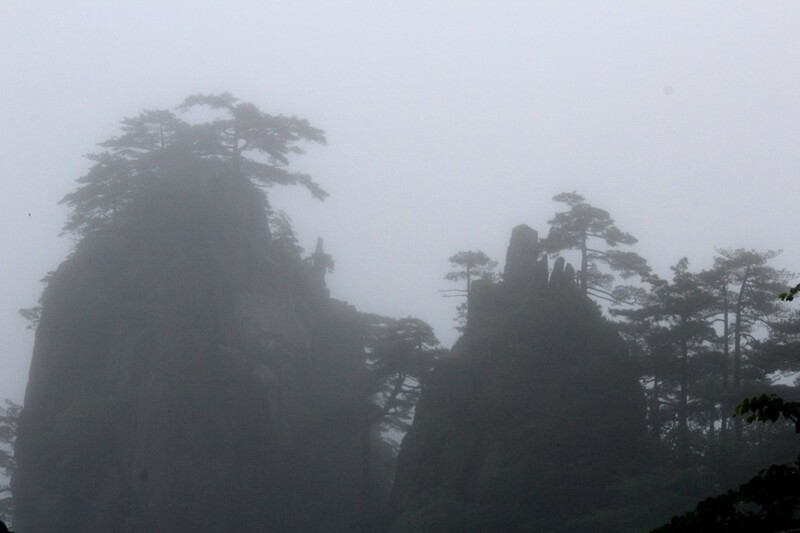 We wished each other good luck and off we went , headed to Huangshan. 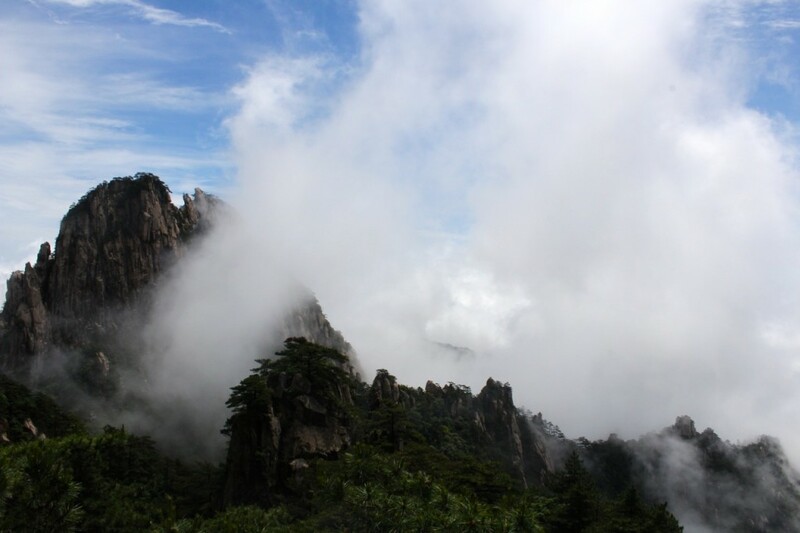 Did we know anything about Huangshan? Of course not. But we learned from Ellen that it is a very beautiful mountain except that a good portion of the year it is shrouded in clouds, often with zero visibility. With rain two out of every three days and over 80 inches of annual rainfall, she could not promise anything. Off we went. Three hours later we were at the tiny village at the base of the mountain, which naturally was invisible due to the clouds and rain. We took a bus going pretty much straight up for a half hour, then a cable car for 15 or 20 minutes up to where the mountain peak—1,700 meters or 5,500 feet–was supposed to be though nothing was visible. At the top we donned our rain outfits and started out in the fog and midst. (We had left our bags behind and carried only a small backpack with essentials.) Our hotel was about a mile and a half away and accessible only on foot. Ellen said it was “a bit up and down” and usually took two hours. For seasoned walkers like us, a mile and a half in two hours seemed awfully long. We should be able to do this in maybe 40 or 50 minutes max. Two hours later we finally reached the hotel, totally exhausted and in my case thankful I had not broken a leg or worse. Shortly after we started the walk the magic began. If you looked closely, actually you could make out steep cliffs and high peeks, which at times became more visible. The whole experience had a fairyland feel to it. It rained on and off and toward the end of our walk was raining steadily. There were few people on the mountain besides us, and we were engulfed by a strange, eerie silence with the only sounds from an occasional bird or the wind sweeping clouds and mist past us. 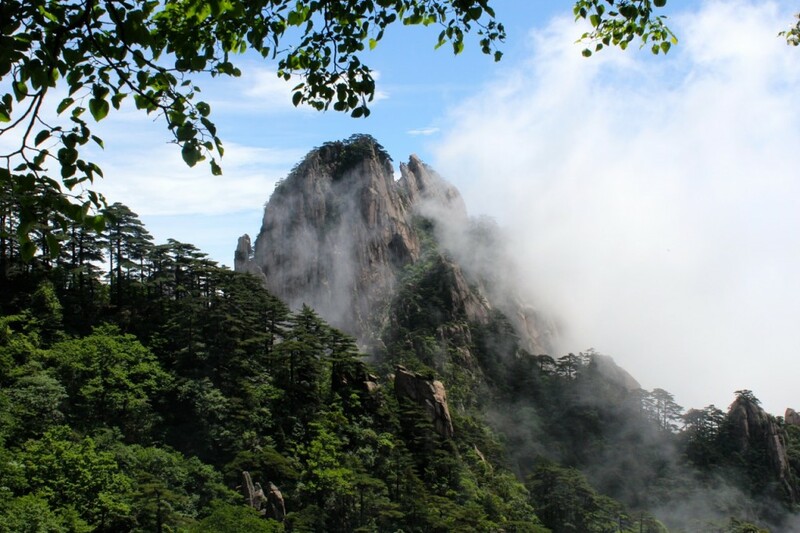 The name Huangshan means “yellow mountains,” but that has nothing to do with color but rather the association (somehow, I never fully understood it) with heaven. We were on a mountain considered by some to be heaven. We tediously made our way up and down steps toward our destination. That for me was the problem. Before we finally reached our hotel, according to the iPhone 6 health app, we had climbed the equivalent of 15 flights of stairs and descended 25 flights. These steps were not typical of what we have in the U.S. They were narrower and steeper and very wet and slippery. In one instance looking down on what had to be at least 500, very steep steps with no hand rail on either side and cliffs below, I came very close to panicking. One false step and you were history. The solution to steady my shaky knees–and nerves– was to place one hand on Embry’s shoulder and one hand on Ellen’s and to inch down. A bit embarrassing, but that is the stage of life I am in. For the record for the two days we were on the mountain, I did not see a whole lot of people who looked like they were in their seventies. We finally made it to a surprisingly elegant hotel (incredibly, one of six on the peak) and celebrated our victory at the fancy hotel lobby bar (like all hotel bars, never any Chinese customers and few customers of any nationality) with a triple Chevas Regal on the rocks for me, white wine for Embry. I had to explain how to fix the triple-on-the-rocks several times to the bartender (and so you won’t be alarmed, one shot of whisky in China is one-half ounce max.) That night I had trouble sleeping because of the fear of getting back the next day. Going up the steps was do-able, going down a nightmare. As luck would have it, we awoke the next morning to blue skies overhead–the first blue sky we had seen the entire time we have been in China–and clouds beneath the mountains. Jackpot! You get this kind of weather only a handful of times each season. The scenery was beautiful the day before in the rain and mist, but on a day like this it was incomparable. The word must have gotten out because the mountain was packed with people. Where did they all come from? 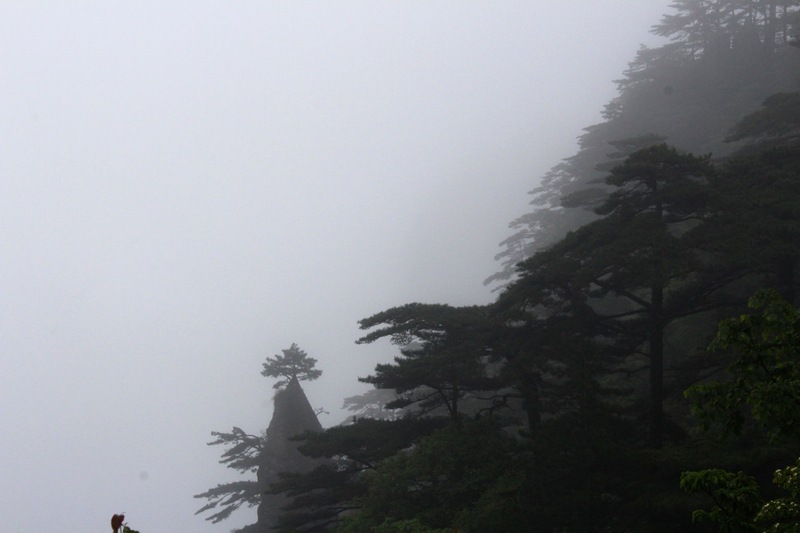 All I can say is that Shangri La does exist, and it is here on Huangshan Mountain. Another one of these Chinese sleepers. Maybe most of the world knows about this place, but of course we didn’t. This was one of the most delightful surprises yet. There are two perplexing questions about this magical place: how did they build six luxury hotels in the first place? They are on a mountain over 5,000 feet tall and 3,000 feet above the nearest road. Second, how do they get food up and trash down the mountain? There are over 2,000 hotel rooms up here. Can you imagine the food, beverage, and trash requirements? I never really got an answer to the first question, but as to the second, over 150 porters hike up the steep trails every day carrying up supplies and carrying down trash, a perilous hike of three hours each way. After the hike back, which turned out to be much easier than the day before because the steps were not slippery and there were more steps up (25 flights) than down, we took the cable car down, then the local bus, which let us off near the restaurant where we had lunch the day before and had left our luggage. As always, our driver was patiently waiting. That afternoon we took the back roads through lush valleys and tiny villages with white houses, mainly following a roaring stream. 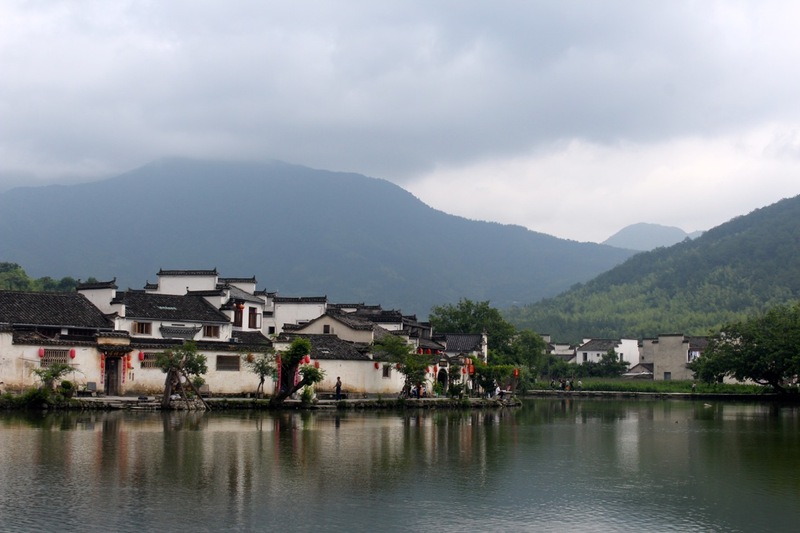 We made a stop at famous World Heritage site that afternoon (quaint and picturesque) and eventually arrived at our Crown Plaza Hotel alongside a wide river in Huangshan, a “small” town of about 200,000. This is also Ellen’s home town and she was proud to give us a quick tour of the gated community she lives in. This is a typical new development with many high rises and lots of stores, a kindergarten, a supermarket, and various community amenities. Her family of four (her mother is the live-in baby sitter for her three year old, and commutes every week from the farm where she and her husband live ) has lived here in their three bedroom, 1,200 square condominium for four years (original cost $50,000 plus around $15,000 for interior finishes, things we take for granted in the U.S. but not provided by builders in China.) She loves it. We settled in early after a buffet dinner in order to be ready to head out early to Hangzhou the next morning. Every day is a new adventure in this county of infinite surprises. This is like having the bandages on our eyes removed, and looking East for the first time. The whole sky deepening, and changing color as we watch the dawn; as it becomes the day. Wow, our trip to China back in 93 pales in comparison to what you guys are experiencing. Cannot wait to see you all next month to hear more about it. How about civil liberties? The fact that you are on a highly curated/ guided tour of China where everything is beautiful and everyone is happy makes me wonder if indeed everyone is happy and everything is beautiful.